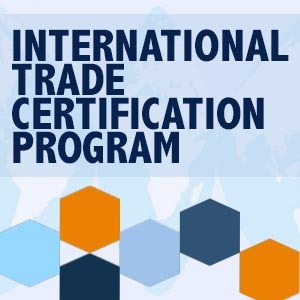 BACKGROUND: The International Trade Certification (ITC) was developed by the WTC-KY to provide the foundation for effective and efficient management of a company's international trade operations by providing information that is both current and relevant. Become your company's international expert, grow your company's sales, and ensure your company is utilizing best practices in international trade operations. Participants who complete all three courses and score 70% or higher on an on-line examination will receive a certificate of Global Commerce Specialist. RESULTS: The ITCP has an alumni network of over 300 graduates representing 150+ companies and organizations to date. These alumni earn his/her certificate of “International Commerce Specialist” after three rigorous days of class time and individual testing. The International Commerce Specialist certificate is accredited by the National Customs Brokers and Freight Forwarder's Association of America (NCBFAA). For the course syllabus, click here. *The certification is an approved STEP Grant reimbursement. If you have not applied for the STEP (State Trade and Export Promotion), please visit www.kyexports.com for more information. Please note that there are no refunds within 7 business days of this event. Your email address must be in the WTC-KY member database to receive member pricing. If your company is a member but you are not recognized at registration or if you have any other questions, please contact Mark Peachey at mark.peachey@wtcky.org. or 502-574-1514.